Flexible sheet magnets, which are commonly used for refrigerator magnets, combine ceramic ferrite magnet powder with a flexible thermoplastic binder. The manufacturing process involves injection molding, which is well suited to high volume applications. The flexible nature of the material enables forming into intricate, tight-tolerance shapes. However, since the material is an alloy of ceramic ferrite material, the magnetic strength is weaker than a solid ceramic magnet. 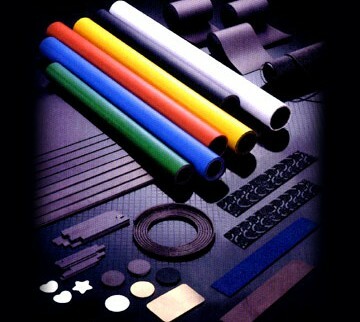 Still, the versatility of the flexible sheet enables its use in many applications. Flexible sheet is often magnetized in a multi-polar arrangement: N-S-N-S. The North and South poles are spaced close together, anywhere from 2 poles per inch to 60 poles per inch and up. This is useful in holding applications because a higher pole density results in higher holding forces. For a sensing application, a high pole density allows tighter resolution. Flexible sheets come in various thicknesses and widths. Thicknesses vary between 0.020″ and 0.375″. Widths vary from 0.187″ up to 24″. The material can be sold in strips up to 100 ft. long. Also, some come with an adhesive backing, which can simplify assembly if needed. The magnetic orientation is normally through the thickness. 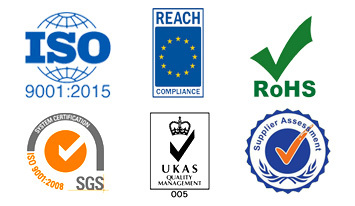 NEMC Flexible Rubber Magnets are RoHS compliant.